"The MV Malabar sinking was a huge event in Sydney over Easter 1931"
We leave Kings Creek Resort and drive towards Yulara. As we go, we see piles of dead timber along the road. It looks as though someone has been collecting it from the bush and placing it here. Perhaps it is a work for the dole scheme for the local Aborigines and the timber is put there for tourists to collect and later use. I cannot think of any other reason for it. It is a long drive from Kings Creek to Yulara but it is a very good tarred road. We sit on 90 to 95 kmh. 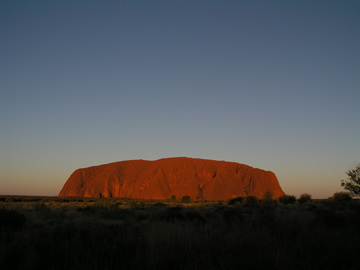 At about 9:30 am one of our cars calls me over the radio saying that they have seen Uluru (Ayers Rock). I look at my GPS and reply that it cannot be Uluru, as we are still well over 100 kilometres away. It turns out that this is Mt Connor. This is a very similar shaped and sized rock that also sticks up out of the desert. 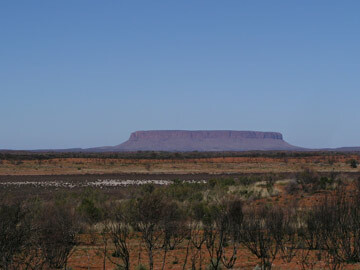 It is located on the Curtain Springs Station and as opposed to Uluru, it has a lot more vegetation around it. Just less than two hours after leaving Kings Creek, we stop for morning tea at a picnic area near Mt Connor. This has some nice views of this spectacular rock. We have travelled just over 150 kilometres this morning. We set out for Yulara and about 28 kilometres down the road we come to Curtain Springs. This is a cattle station that has diversified into camels and tourism. We have a quick look around and decide that on the way back out we will stay here a night. More about it later. We continue on and 85 kilometres later we arrive at Yulara. This is the township set up purely for tourism for Uluru. We book into the camping area which is pretty nice. It has barbecues, tables and shelter as well as a lot of room. The cost is $50.20 for two nights for us. It is about lunch time so after setting up our tent, we have lunch. While we are doing this a bloke comes around and offers us a helicopter flight at a reduced (stand-by) rate. As we have other plans, we decline but I remember this for later use. After lunch we head out to Uluru. It cannot be seen from the camp site but you can see it from a sand dune nearby. It is a bit over 15 kilometres to Uluru. It costs $16.25 per person for three days, quite reasonable considering what is charged in NSW to visit some national parks. On the way we stop off at the sunset viewing area and pick out where we want to be parked to get the best photographs. 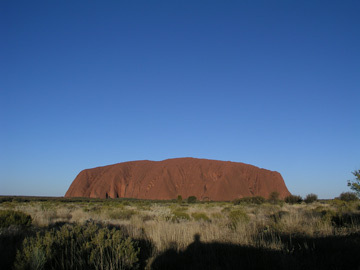 Uluru is truely huge and amazing. Its grandeur cannot be shown by photographs and it is much larger than I had ever envisaged. We go onto the Cultural Centre which is only a kilometre or so from the rock. We then go to the Marla Carpark which is where most of the walks start. We have afternoon tea here. After this we drive to the sunrise viewing area where I take some photos. It is now about 5 pm so we head back to the sunset viewing area. We get there about one hour before sunset of 6:18 pm. The carpark already has a lot of cars but we get the spots we previously identified as being the best. The carpark is full by 5.:45 pm and overflowing by 6 pm. We set up our cameras (on tri-pods) and put out some chairs in front of the cars and sit back and have a few beers and nibblies. Nearly everyone is doing a similar thing. I go for a walk to the bus area and find tables set up where people are having champagne and obviously after sunset are having a full meal here as well. What to say about the sunset? 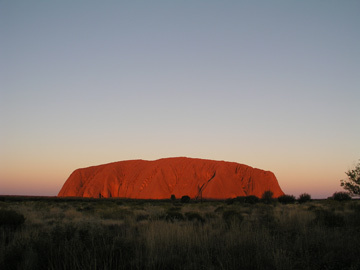 The colours of Uluru change dramatically every few minutes. I have set my camera up and use the remote to take a photo every minute or so. It is a fantastic sunset and the photographs show a little of the majesty of the sunset. You must do this at least once in your life. After sunset is well and truly over, we head back to the resort and dinner, similar to last night. After dinner we start a fire in the fireplace. As we have the only firewood available, we soon have a crowd of people, mostly backpackers, around it. They are from all over the World and it is interesting to talk to them. We even run into a couple who we met in the Alice Springs caravan park. In the morning I was going to climb Uluru but as we enter the park we see that the climb is closed due to high winds. Not sure where they are as it is absolutely still, even out there. Frank and I drive to The Olgas (Kata Tjuta). 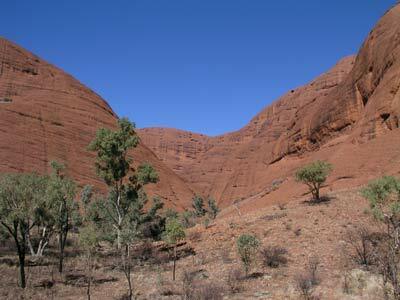 It is about 35 kilometres to the viewing platform for The Olgas. It is worth stopping here and taking some photographs. 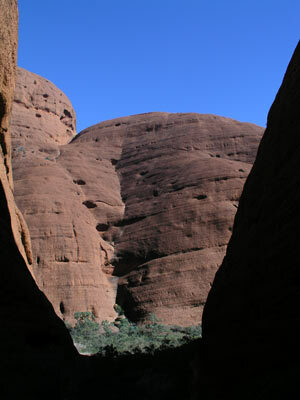 A further 20 kilometres brings you to The Olgas themselves. This group of rocks is far more interesting than Uluru in my view and much better than shown by any photograph I have seen. As Frank still has a crook ankle, I set off alone and do the Valley of the Winds walk. This is about 7 kilometres long and it takes me one hour and 45 minutes. It is mostly flat and has lots of interesting gorges to explore. A brilliant walk. While I was doing this, Frank went off and took some photographs in my car. After I return (I used my portable UHF radio to call him), we go to the Gorge Walk. Frank does this short walk which takes us about 40 minutes. This is suitable for most people. We then have lunch and after, drive back to Uluru. While I do the 9.6 kilometre walk around the rock, Frank goes off and takes more photographs. It takes me just over two hours to circumnavigate it. It is quite an interesting walk. In spots the track goes right next to the rock and in other spots it is about 100 metres or more away. For one section you are not permitted to take photographs due to Aboriginal concerns. Then we head back to the camping area. We have steak and sausages for dinner. After dinner, we have another big fire, with many people around it.